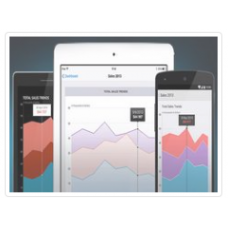 Create fast, beautiful, cross-platform mobile apps. Ultimate UI for Xamarin includes 45+ native controls for Xamarin.iOS, Xamarin.Android, and Xamarin.Forms that enable maximum code-sharing and incredible performance. It includes: Data Grid, Data Chart, Category Chart, Pie Chart, Radial Gauge, Linear Gauge, Bullet Graph and an Excel Library. Fast, full-featured, easy-to-use components give you the power to create high-performance, cross-platform mobile apps with controls for Xamarin.Forms, Xamarin.iOS, and Xamarin.Android. Data Grid - lightweight, feature-rich Data Grid control when you need to display lots of data without sacrificing mobile device performance. Data Chart - display your data in multiple series and types, with animated transitions, and with modular design capabilities for legend, axis, markers, series, trend lines, and interaction layers. Category Chart - a touch-enabled charting control makes visualizing category-based data a breeze. Built on the industry’s best-performing, feature-rich data chart, the category chart simplifies the complexities of data visualization into a simplified API that anyone can use. Radial Gauge - show off Key Performance Indicators (KPIs) with rich style and interactivity. These round and semi-round gauges are powerful, easy to use, and highly configurable—perfect for dashboards displaying clocks, industrial panels, automotive dashboards, and even aircraft cockpits. Linear Gauge - make your data visualizations and dashboards more engaging with a powerful, easy to use, highly configurable Linear Gauge that shows off Key Performance Indicators (KPIs) with rich style and interactivity. Bullet Graph - create attractive data presentations with the Bullet Graph control, replacing meters and gauges with clear, simple, straightforward graphs. The Bullet Graph is one of the most effective and efficient ways to present progress towards goals, good/better/best ranges, or multiple measurement comparisons in a compact horizontal or vertical space. Formulas and many more. It’s easy to represent the data of your application in an Excel spreadsheet as well as transfer data from Excel into your application. App Map - allows you to lay out your entire Xamarin.Forms application using a familiar Microsoft® Visio®-style diagram interface. Design your app in minutes by dragging and dropping pages, child relationships, and navigation instructions onto the design surface. Once you're happy with your application layout and flow, AppMap will generate all the Views, ViewModels, and navigation code based on a best-practice Prism MVVM architecture. Toolbox - the Xamarin.Forms Toolbox includes all the Xamarin controls by Infragistics, as well as the Xamarin controls native to the platform for quick access to design your page – automatically adding the namespace and XAML for your selected control.